As we get our first taste of Spring, with the sheer delight of warm sun penatrating our skin after a very long winter, we at Esquina have our outdoor dining tables set up. 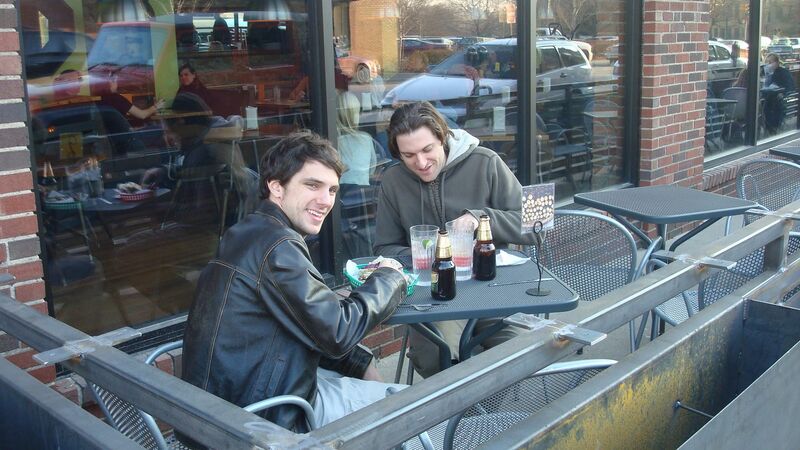 Below are our very first patio guests – don’t they look happy? Starting Monday we will open at 11AM daily for lunch – I will be there so come and say hi. Coming up with my own words is proving difficult after serving about 1 million tacos tonight (maybe an exaggeration, but it doesn’t feel like it), so I who better to quote than Shakespeare? Hi Molly! I haven’t been in yet, although VERY excited to fight the crowds I’ve seen to get my Esquina Fix! I’ve heard raves on the chicken and seafood varieties of tacos so far! Beautiful location, beautiful restaurant, delicious food! My husband and I stopped in tonight and loved the atmosphere. Do you mean the ones holding the infusions at the front of the bar? If so, they were a gift and I don’t know where they came from. Good luck with the wedding plans! I do! And just as I commented you posted with some gorgeous pictures of them.